BEIRUT • The Syrian army and its allies have taken Albu Kamal, ISIS' last major stronghold in Syria, representing the end of the militant group's project in the region, the army general command said yesterday. The army said it is now fighting the last remaining pockets of the Islamic State in Iraq and Syria (ISIS) group in the country's eastern desert, an army statement said. "The liberation of Albu Kamal city is very important because it signals the general fall of the terrorist Daesh organisation's project in the region," a statement from the general command said, referring to ISIS. ISIS has been all but destroyed over the past two years. At the height of its power in 2015, it ruled an expanse of Iraq and Syria, eradicating the border, printing money, imposing draconian laws and plotting attacks across the world. Alongside Lebanon's Hizbollah and other Shi'ite militias, and backed by Iran and Russia, the Syrian army has recently seized swathes of land from ISIS. Albu Kamal, on the Euphrates River, is located in Syria's eastern Deir Ezzor province on the Iraqi border. On Wednesday, during the battle, Hizbollah forces entered Iraq and the Iraqi Popular Mobilisation Forces crossed into Syria to help capture the town, a commander in the pro-Damascus alliance told Reuters. The oil-rich eastern region near Syria's border with Iraq had been one of the militants' most important sources of funds, and its strategic significance resulted in a race to claim victory there. That contest has been won by the military of Syrian President Bashar al-Assad and its allies in Moscow and Teheran, over a Kurdish-Arab force partnered with the West. 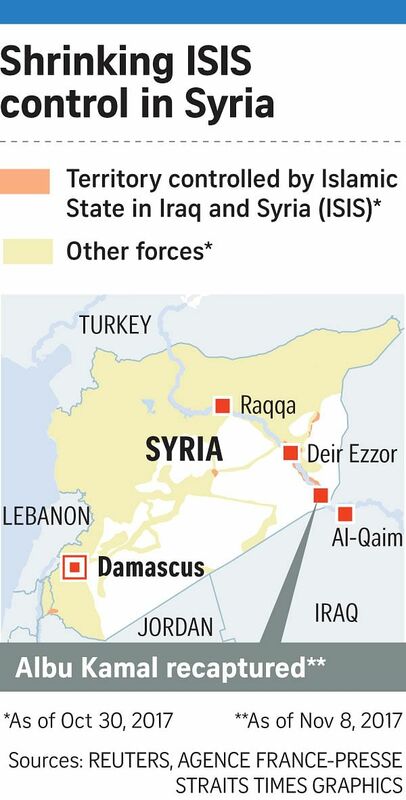 The President now controls all of Syria's major urban centres. The rest, including the fractured beginnings of a self-administering Kurdish region in the north, is ruled by opponents. What comes next might include localised ceasefire agreements, a push towards broader peace talks, or more conflict - or all three. But whatever it is, more than anyone else, Mr Assad will dictate the terms. "The demise of the Islamic State as a conventional force this year is going to give the loyalists the momentum and the opportunity to try to finish the war next year," said Mr Omar Lamrani, senior military analyst at Texas-based advisory firm Stratfor, using another name for ISIS. In September, Mr Assad's troops, backed by Russian air strikes and Iranian-supported militias, broke a three-year ISIS siege of Deir Ezzor city, sited on the western bank of the Euphrates River, and a nearby airbase. The deployment of his full range of military assets signified an intent to reimpose government authority over as much of Syria as possible, especially its major economic resources and sensitive border areas. A countermove began a few days later. US-armed, Kurdish-led militias peeled off from their own fight against ISIS in its former capital of Raqqa to embark on a high-speed drive towards Deir Ezzor, about 120km to the south-east. They captured several oil and gas facilities, including the country's biggest: the Conoco gas field and the Al Omar oilfield. The prize of Albu Kamal, though, was beyond them. The collapse of the self-declared "caliphate" is the latest development to shift the dynamic of a brutal war of attrition that has left half a million people dead in Syria, millions more stuck in refugee camps, and much of the country in ruins.